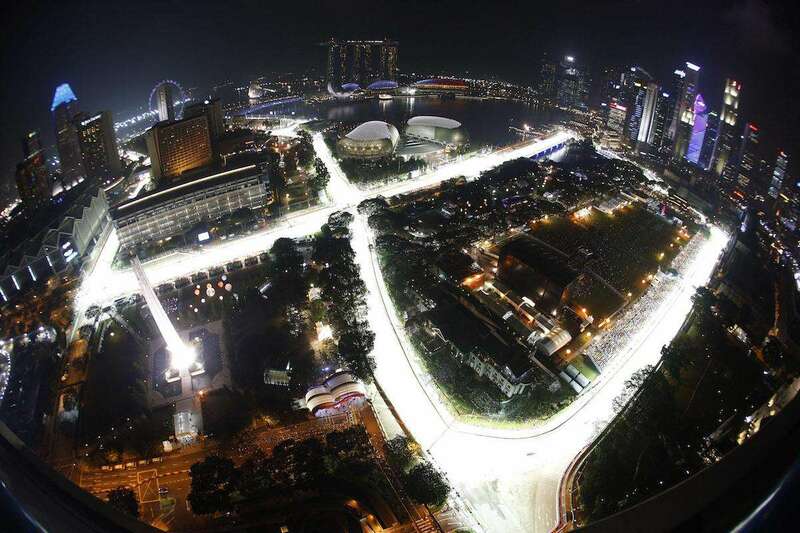 Images © f1destinations.com & Singapore GP. The Editor attended the 2017 and 2018 Singapore Grand Prix. No matter which grandstand (or walkabout ticket) you choose, you won’t get a view of much more than the section of track directly in front of you. 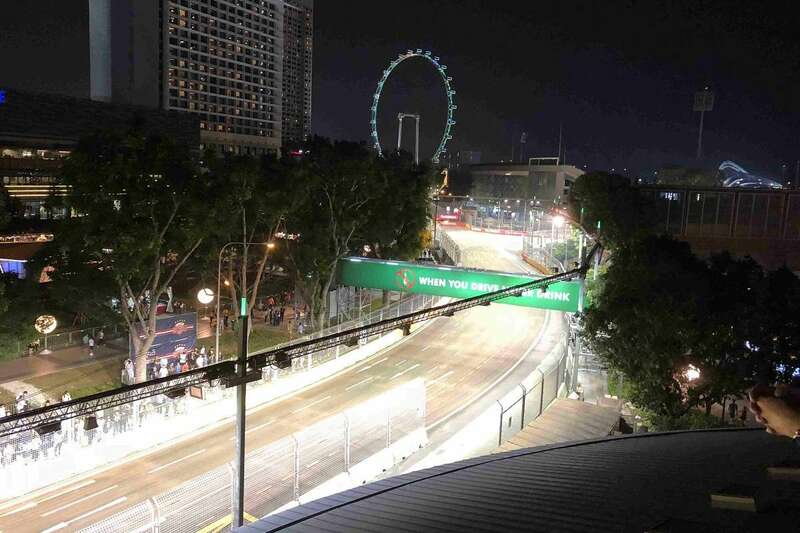 That’s the nature of a street circuit, but the thrill of F1 action under lights and the amazing backdrop of the Singapore skyline by night go a long way to compensating for this. Add to this the vibrant trackside atmosphere and daily concerts by some big name acts, and you have the recipe for a unique F1 experience. The Singapore Grand Prix is an immensely popular sporting event, drawing both locals and up to 40 000 tourists to Marina Bay each September. Super early-bird discounts (save up to 30%) apply until November 15, 2018. Discounts also apply when purchasing 4 or more tickets. Support the development of this site by buying your F1 tickets from Gootickets. We receive a small commission when you buy using the links on this page. We don’t apply any markup, so you’ll always pay the cheapest price! Zones: The Marina Bay circuit is divided into four zones which control your entry and movement around the circuit. The more expensive grandstand tickets (and Premier Walkabout tickets) offer access to all four zones, whilst other tickets limit your access to just one or two zones. Singapore is famous for the concerts which take place after the on-track action each night on two main stages in Zone 1 and Zone 4 (Padang Stage). If you are keen to see one of this year’s acts then be sure to make sure your ticket gives you access to the zone where the concert is taking place. Zone 1 Walkabout Combination: only one combination ticket remains in the 2019 ticket offer. It’s a good option for first-time visitors. You sit in the Pit Grandstand on Friday and Sunday, then have roaming Walkabout access in Zone 1 for race day. Single-day tickets: only available for some ticket categories, including Walkabout. Not yet on sale for 2019. Sky Suite: pit straight hospitality with access to an incredible rooftop terrace. Choice of restaurants, plus free-flow champagne, fine wines and spirits, beers and soft drinks. 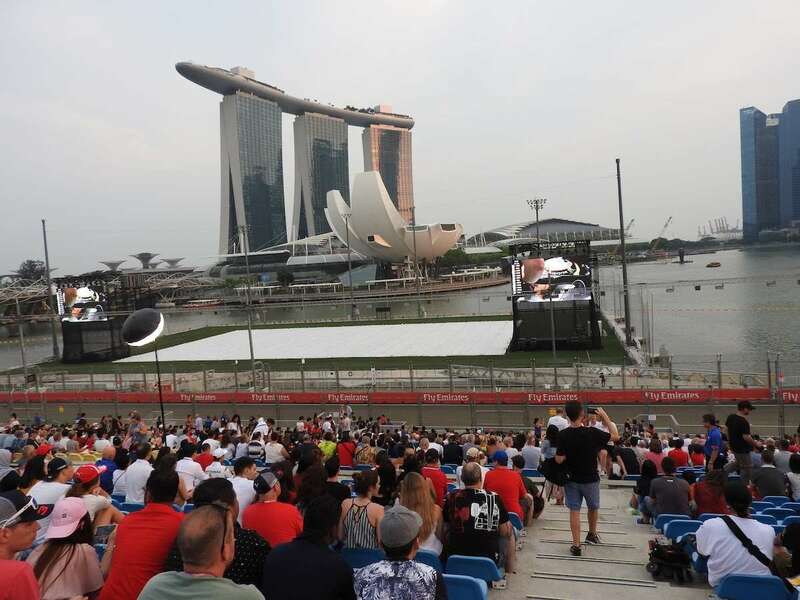 All Grandstands at the Singapore Grand Prix have at least one large TV screen where you can follow the on-track action. For the majority of grandstands at Singapore, we advise choosing a seat in the highest possible row (generally 12 and above) to get a better view of the circuit above the catch fencing. This advice is not valid for Bay Grandstand, where it’s a good idea to not be too high, more on this below. The Pit grandstand stretches the length of the start/finish straight and is comprised of sections AA and AB (near the final turn 23) and sections A1-A22. Sections A3 and A4 have the best view of the podium celebrations, A15 is right on the start line and the higher numbered sections are closer to turn 1. Each section of the Pit grandstand has 16 rows – get a seat in the higher rows if you can. These seats are best for action in the pits and the start/end of the race, rather than for on-track action. Access to Zones 1-4. The Turn 1 grandstand is split into sections A2-A8 and has 20 rows. The lowered numbered sections, A2-A5, are located before the corner so you will be mainly looking at the rear of the cars. The pick of the seats here are in A7, close to the track and right on the apex of Turn 1, where you can also see the cars enter Turns 2 and 3. Sections A8-A9 are set back from the track but also have a good panoramic view of the main straight, pit exit and opening corners. Access to Zones 1-4. The Turn 2 Grandstand is split into sections A1-A6 and faces back down the pit straight. 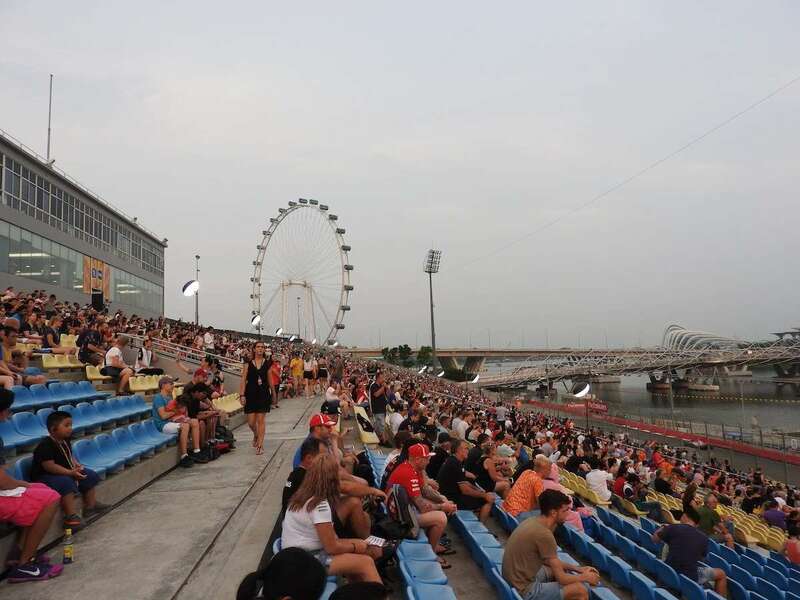 Fans seated here have a view of the opening three corners of the Marina Bay circuit as well as the pit exit. The A1 section has a view straight down the pit straight (great for the start) whilst the A6 section is closer to turn 3. Recommended. Access to Zones 1-4. The Connaught Grandstand is a decent mid-price choice for on-track action. It’s located on the inside of Turn 14, where several incidents have happened over the past few years. There are eight sections in Connaught, A1-A8. The lowered numbered sections A1-A3 (with only seven rows) are best to avoid as they are located before the corner. The better choices are A4-A8. Get a seat in the back row here (row 15) and you will also get a view over the back of the grandstand to Turn 8. Access to Zone 4 only. The Stamford Grandstand has seven sections, A1-A7 located between Turn 7 (lowered numbered sections) and Turn 8 (higher numbered sections). Turn 7 (Memorial) is a slow left-hander offering overtaking opportunities and so it’s probably better to choose a low numbered section at Stamford, even though some seats in the higher numbered sections also afford a view of Turn 14 (as well as Turn 8). Rows in Stamford are numbered up to 24 and higher is better in this stand, as with most grandstands at Marina Bay. Access to Zone 4 only. Esplanade Waterfront grandstand is located on the outside of the circuit between the slow-speed Turns 16 and 17 (the location of Nelson Piquet’s infamous accident in 2008). There are three sections, A1-A3. The best option here is A3 (also the highest part of the stand) where you can also see the cars approach Turn 18. This stand is also close to the Esplanade Outdoor Theatre with entertainment and food/drink outlets. There are better grandstands than this; not recommended. Access to Zone 4 only. Padang grandstand is located on the inside of the circuit between Turns 9 and 10. Sections are numbered A1-A10 and B1-B11. If you go for this grandstand, the best sections are those closest to the corners – low-numbered A sections for Turn 9 and high-numbered B sections for Turn 10. Padang is not a great choice for on-track action, but is worth considering for its proximity to the Padang stage where the biggest concerts take place over the weekend. Access to Zone 4 only. Walkabout tickets at Marina Bay are the equivalent of General Admission tickets at other races; you don’t get a reserved seat. Instead, there are bleacher-style viewing platforms around the track, none of which offer much elevation (you will be looking through the catch fencing). Views can be obstructed and in some places, you will only get a fleeting view of the cars on the track. The best days to take advantage of the Walkabout tickets are Friday and Saturday when there are less fans competing for space on the viewing platforms. A good strategy is to check out the different views on the first days, chose your preferred spot, then get there early on Sunday to claim it for the race. Two types of Walkabout Tickets are sold in Singapore – for Zone 4 only and for all zones (Premier Walkabout). Both are available as a three-day pass. The more expensive Premier Walkabout tickets give you plenty of flexibility to check out different corners, but are more expensive than the cheapest Bay Grandstand and you should only consider this option if you are ready to cover a lot of ground (in Singapore’s heat and humidity) to get your money’s worth. Some of the best viewing areas for Premier Walkabout ticket-holders include the opening turns 1-3, turn 5 (where you can get very close to the action) and the final turns 22-23. Zone 4 tickets are a good budget choice with access to viewing platforms on Esplanade Drive and Raffles Avenue as well as entry to the biggest concerts each day on the Padang Stage. Been to the Singapore GP? Tell us about your favorite grandstand in the comments. How do I get to know which ticket gets me better view for the concerts? Hi Aditi. The tickets are for the on-track racing – there are no seats which offer a view of the concert stages. The biggest concerts are held on the Padang Stage in Zone 4, which is accessible to all ticketholders (this year, Pharrell Williams is playing on Friday, September 18 and Maroon 5 is playing on Saturday, September 19). There is a smaller stage in Zone 1 called the Village Stage (Spandau Ballet is playing there this year on Saturday, September 19). If you want to see this concert, you need to ensure that the ticket you buy gives you access to Zone 1. I hope that helps. If i buy bay grandstand ticket, can i see maroon 5 and bon jovi too? Yes, you can! All the big acts play on the Padang stage in Zone 4. If you buy tickets in the Bay grandstand, you get access to Zones 3 and 4. Enjoy the race and the concerts! Hi, thanks for your question. As it is your first race, I would go for a combination package so you can get different views over the weekend. For me, the experience of walking around the different parts of the track is just as good as sitting in your seat. If you take the Padang combination ticket, you won’t see the race start/finish, but you will save a few dollars and still get to see how everything works. Have a great weekend! This will be the first time for my wife and I to watch F1. Is it ok to watch on Friday or is it really better to watch on Saturday? Thanks! Hi Andrei, if it’s your first time at a race, you will enjoy the action on Friday. There are still two F1 sessions and lots going on. Be quick though, as Friday tickets are the cheapest and always sell out first! Hope you enjoy the experience. The answer is no, I am afraid. If you want to see the Maroon 5 concert on Saturday, you will need a valid race ticket for that day. Hi Karen. The circuit is open from 3pm to midnight each day of the weekend. The majority of tickets are for three days, but there is a Sunday-only zone 1 ticket for $838 SGD (until May 2), which gives you a seat in the Pit Straight Grandstand. If you think you will make it on Saturday night, then buy one of the cheaper 3-day tickets so you can get access (for the concerts too). Hi, firstly thank you for you detailed report above, very informative. I’m looking at buying 2 tickets in turn 2 grandstand, could you give me a little help as in what section and row to sit in please? A good view of the track and also the tv screen would be great, went to the Belgium GP last year at Eua Rouge and my only issue was the tv screen was so far away! Hi Bryan, thanks for getting in touch. 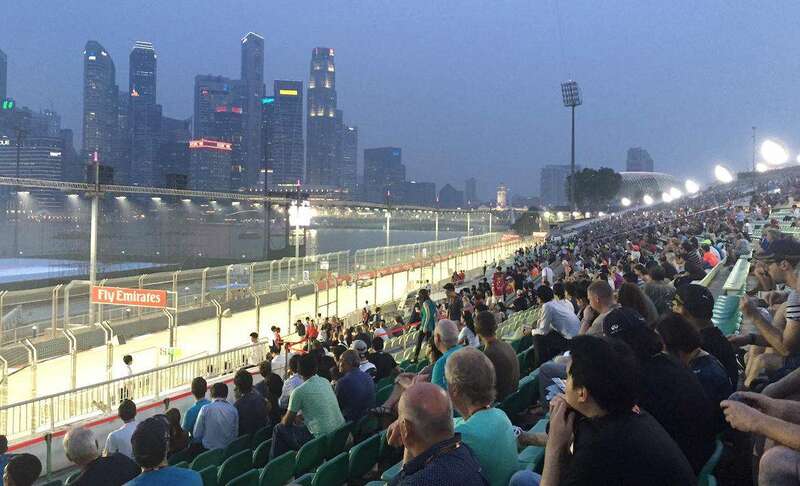 Turn 2 is a good choice at Marina Bay. I haven’t personally sat in that grandstand, but the A1 section is a good choice, as you get views down the pit straight. The downside is you are a little further from the track. Always go for higher row seats if you can so your views aren’t so obscured by the catch fencing. Enjoy the weekend! I’m looking at getting two tickets for the pit straight. I see that it goes from block A1 to A22 – which block would put me in front of the cars as they start as well as directly in front of a TV screen? Also – I see you recommended the Turn 2 Grandstand. Does this have a view of a TV screen? Yes, all grandstands have a view of a TV screen. Sorry, I can’t be more specific on the best blocks in each grandstand to give the best TV screen views. Enjoy! In the pit straight grandstand, block A14 will put you right on the start line (A4 for finish line and A1 for podium). I am not sure on the exact placement of the TV screens, sorry. If you want to see the seating map for each grandstand, go to singaporegp.sg and select the ‘Buy Now’ button. Hi Johnny, both tickets give you access on all 3 nights to the big Padang Stage in Zone 4, where all the headline concerts are held. There’s also a smaller stage in Zone 1 that can also have some good concerts. You won’t get access with the Bay Grandstand ticket, which only gets you into Zones 3 and 4. Bay Grandstand is not the best, but it can be good to have somewhere to sit for the race itself, and the rest of the time you can wander around in the Zone 3 and 4 walkabout areas. Enjoy the race! Would you recommend me buying a ticket for Esplanade Waterfront please? What advantages does it have in contrast to the other sectors? 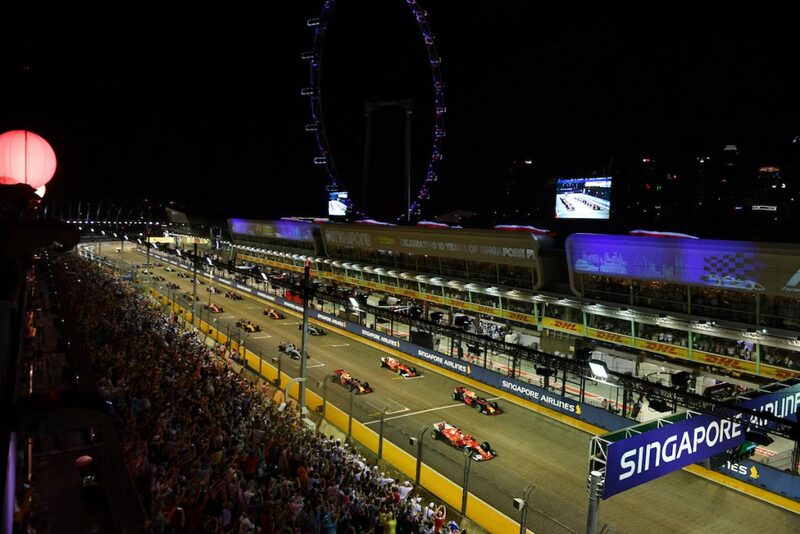 HI – the ticket allocation is automatic on Singapore F1 tickets site. how can I follow your recommendations for best seating areas? Hi David, if you want to buy on the official website (singaporegp.sg), you need to click on ‘buy now’ and then it will give you the ability to choose your zone and specific seats. If you want to buy from another ticket outlet, you will need to call them directly for specific zones/seats. Hi! Is there a significant difference between the Padang Combination and Bay Combination tickets? There is a 100 SGD difference between the two and we’re wondering if we could get a better experience if we opt for the more expensive ticket (Padang Combination). Thanks. Hi, there’s not a significant difference. You sit in the same three grandstands with both tickets, just on different days. Thank you for the prompt reply. This blog is by far the most informative and it helped us a lot in choosing the right seats for our budget. Kudos and keep ’em coming! i’m going to Singapore 28 December 2016 with my family.would you recommend me which the best familiar hotel in Singapore? Thanks for your in depth analysis.I’m from Adelaide originally too. Hi, is there any tickets counters near the gates that day? Is it possible to buy regular tickets? Hello Gary, there are ticket booths near most gate entrances (plus at points around the city). Not sure what you mean by regular tickets, but if you are talking about the cheapest ‘Walkabout’ or General Admission tickets, they do sell out before the race, so best to buy online now if you can. Good luck! When I look for tickets online, they usually don’t provide a row or seat. How do I apply your advice and sit higher or lower in different sections if they don’t tell me where I’m sitting? Also…When will I eventually learn my seat number? Hi Joe, if you are booking on the official SingaporeGP.sg website, you can choose yourself after you click ‘Buy Now’. For other ticket companies (e.g. Gootickets, BookF1), your best bet to get the row/seat you are after is to call the ticket company before you book. If you have already booked and don’t know, I guess you will have to wait until your tickets arrive! Enjoy the F1 night race! Hi, I want to ask you what are the privileges that I can get from the singapore gp 2016 ticket? Hi these could be described a pre-marital privledges that could be, in assistance to a paddock pass and espresso tent access, via the rear flap at the back of the motorhome. Does this help? Can I still get 2 zone 4 passes please? Some error on site saying sold out? Or can I buy at gate? Hi, the 3-day Zone 4 walkabout tickets ($268 SGD) are sold out for 2016 and won’t be available at the gate. However, you can still purchase 3-day Zone 1-4 walkabout tickets ($498 SGD) at singaporegp.sg. Single day Zone 4 walkabout tickets are also still available (Friday $78 SGD / Saturday $168 SGD / Sunday $198 SGD). Thanks very much mate, ended up buying 2 x premium walkabout tickets for $498 SGD so all in for the race, and hopefully the local government don’t seed the rain clouds so we get our first ever taste of an exciting wet night grand prix! What a spectacle that would be! Great site … Well done – do you know if the premium walkabout 3-day (zones 1,2,3,4) provides any access to grandstands or are they off-limits? Thanks for the reply, I will go for walkabout (By when do they sell out ? & One more question. Do they open the gates for track invasion like Sepang and Monza or is in only reserved for the Gran stand ticket holders ? Hi Sam. Yes, they do open the gates for a track invasion after the race. There’s more info in our Trackside guide: “access is granted to fans in Zone 1 via a gate at the public viewing platform in front of the Turn 1 grandstand. A gate is also opened right opposite the podium allowing fans in the Pit Grandstand to enter the track.” That means you will need to have a Zone 1-4 walkabout ticket (rather than just Zone 4 walkabout). Best to buy before May 8 to get the early bird discount. Thanks to you & your team I planned Sepang 16. Hi Andrew! Great site, thank you very much for the info. Which would you recommend between Stamford grandstand and Esplanade Waterfront? Hi Sebastian, if you can afford it, pay a bit extra for the Stamford grandstand tickets. The views are a bit better and there’s always an incident or two at this section of track. Hi we are hunting as a group of 4 for best 3 day tix options in the either SuperPit grandstand (is that new this year as a ‘new’ sticker next to it on web site) or good seats for turn 1. Which would you go for and are there better rows in either to clear the fences which do obstruct the view a little. Very helpful page this is. If I had to decide between Bay Grandstand and Premiere walkabout , what is your suggestion. I will be attending all the three days. Would the extra money spent on walkabout be worth if I really explore the circuit over the 3 days. This is the most detailed and patient answering i have seen, stretching over years! I intend to go to the GP only on Sunday. or is it better to book a seat at the Padang grandstand? And if it’s the latter, which seats should i be going for? This is my first GP. Premier Walkabout is good if you like to explore and don’t need a guaranteed seat. The other advantage is that you can visit all the zones with this ticket. Padang is not a great grandstand, but it’s close to the big stage for the concerts afterwards. Thanks for the detailed and patient review. Can you tell me if i can get T1 or Pit grandstand access only for sunday? I have checked the site, it seems to sell these tickets only for 3-days. Hi, T1 tickets are only sold for 3 days, but you can buy Pit Grandstand tickets for Sunday. The discount over the 3-day price is not that great however. I am about to buy the ticket for this year but I couldn’t decide. I would like to ask you if my two concerns are to get into the track to see the podium after the race and to have time to go up on the Singapore Flyer which type of tickets should I buy. Now I have three choices: Premier Walkabout, Premier Walkabout Combination, and Pit Combination. All the prices are fine for me but I just can’t choose. It depends if you want/need a seat at all. If you don’t need, then go for the Premier Walkabout. But the combination tickets are also good if you want to see some different views. There’s no such thing as a Premier Walkabout Combination? If you mean Zone 1 Walkabout, I think this is the best of the ones you nominated. Hello, I am trying to get a ticket for Stamford Grandstand for 2019, I would like to know which A seating area is right opposite to the TV that show the race and qualify. THanks for the write up. Just wondering what your opinion is on the mid-tier grandstands? Which do you think offers the best viewing experience? Which seats should I be looking to book in this grandstand? Hi George, I haven’t really sat in the mid-tier grandstands, so can’t give an honest view. I much prefer having access to Zone 1, so I’d probably choose the Zone 1 Walkabout Combination, where you sit in the Pit Grandstand on Friday and Saturday, then have Walkabout for race day. Hi Dean. Good news that Muse is playing next year. Bay Grandstand doesn’t have the best views of the track – but it does have a great view of the skyline. I’d say it’s about a 15 minute walk from the Padang Stage. what package would be suit my wants best? Thank you very much for this article, helped a great deal as I purchased my tickets, this is my first F1 race. I purchased the premiere walkabout, just a question with this ticket, will there be a chance getting close to the drivers for an autograph or a photo during the practice sessions? Thanks again. Your best bet is to hang around outside the entrance to the F1 Paddock, which is located behind the pit garages, not far from the Singapore Flyer. You can see the drivers arriving in the afternoon and leaving later at night after the sessions. Thank you very much, will keep that in mind.